For most people, today was a day to celebrate dads. For my three year old who turned 3 1/2 today, she felt that it was a great day to celebrate her. Who am I to say no to a special request for cupcakes on a Sunday?! Thankfully, I had a box of Betty Crocker’s gluten-free cake mix in the pantry so I knew that we could make quick work of this request with just a few special touches. (Use whatever cake mix you have in the house if you don’t need to eat gluten free!) 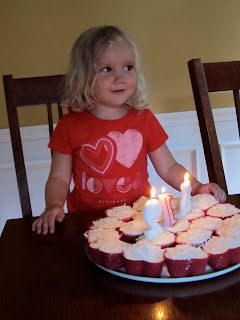 My daughters were begging for strawberry cupcakes – alas, we had no strawberries. After a little negotiation, we settled on pineapple. And, if you are going to have pineapple cupcakes, I think you also need some coconut. After digging around in the pantry for a few minutes, I came up with some flaked coconut and some organic unsweetened coconut milk. The coconut milk discovery got me really excited. I was looking forward to our cupcake creations, but I was thrilled to try to make frosting using the coconut milk! Yum. How pretty are those eggs?! Combine cake mix, pineapple, oil, coconut, and coconut milk. Mix on low for 30 seconds. Scrape down the sides and mix on medium for about 2 more minutes. Makes 24 cupcakes. Bake at 350 degrees for 20 minutes. Combine the ingredients in a stand mixer. Spread on cooled cupcakes. Refrigerate the leftovers immediately so that you are not tempted to eat the frosting standing at the counter.